RPS designs and manufactures products for people that appreciate quality and value. Championed by Elsa, the Icelandic Shepherd, our mission has been to make solar well pumping systems simple and affordable to install, without sacrificing quality and reliability. 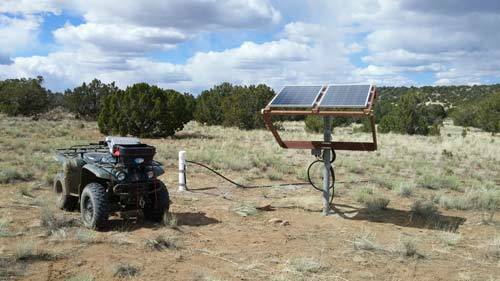 In 2016 RPS became the #1 DIY solar well pump kit in America thanks to customers all over the USA! We hope our passion for solar well pumps is contagious. Most people are looking for a way to avoid the high cost of #1 but want to avoid #2. RPS provides a happy medium between the two. DIY+RPS. A combination of your do-it-yourself skills and tools with RPS quality parts and RPS engineers on the phone, text and email to back you up – a teammate in your solar pump planning and installation. Saving your time and your money is what we do at RPS..
RPS is for people that appreciate quality. For people that don’t want to leave their home or cattle without water. For people that don’t want to haul up and replace their well pumps every 6 months. For people that like to trust in their equipment – in steel not plastic. As more and more manufacturers are cutting corners, RPS remains rock solid. Designed to aerospace standards with food grade stainless. Quality you can trust for years and years to come. No Pressure. Ever. Our Sales engineers are not on commission. We think this is important. Their role is to make sure they find the right pump for you and your well. If we don’t have a pump that will suit your needs we will help you find a solution elsewhere. Our job is to help get you water, not sell you something that isn’t a good fit. 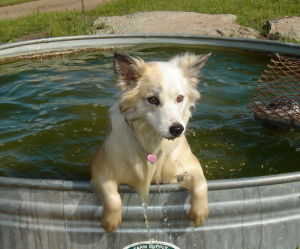 Steady Water! All manufactured products have occasional issues and we can’t claim to be perfect. However we are proud of a PERFECT track record in getting our customers water. This starts with not selling you a pump that won’t work on your land and immediately replacing parts under warranty so you can get up and pumping again quickly. Give you the power! Controlling your ability to pump water out of the ground, whether that is in the field or at home, makes you more resilient. Not relying on the grid makes you more independent. 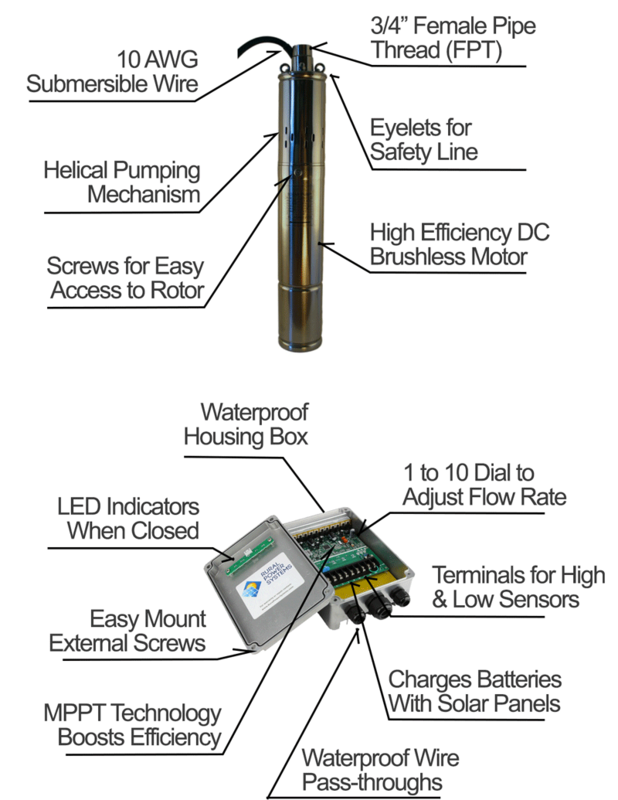 You have most of the know-how already, but our engineers are here to offer knowledge and answer questions so you can install solar pumps yourself, and have total control over your water supply. Our brushless motors are designed to last for tens of years without maintenance. These motors (at the bottom of the pump) turn a stainless steel helical rotor inside a rubber-lined stator. Helical rotors are incredible for utilizing low power, so it makes them perfect for solar use. But these rotors are inherently the weakest point of the entire system, just like all helical pumps, especially in sand or iron-rich soil. With RPS you won’t ever have to mail you pump off to get a factory rebuild. Replace the rotor yourself on site and save time and money. No need to cut wires either, just open up the upper pump end and swap in a new rotor and your pump will operate as it did the day you installed it. 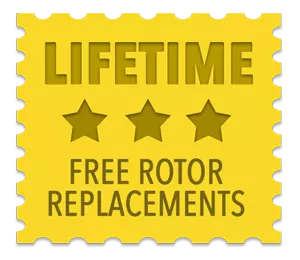 Our Replacement Guarantee Policy means that we will replace these rotors whenever they wear for the lifetime of your pump’s motor. If you start to see a decrease in productivity out of your well over the next few years, let us know. Each kit comes equipped with a backup rotor already, but if you need that one, we will mail off another to replace it and keep you equipped with a spare at all times. 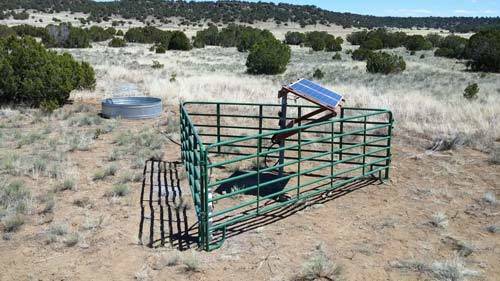 Talk with one of our friendly engineers and learn why more ranchers and farmers trust RPS Solar Pumps. Unlike other systems, with RPS Kits if the sun isn’t shining, you can just flip a switch and power the pump with 12v batteries. Design, Quality Control, Testing and Final Processing in USA. Assembly in China near John Deere factory. We inspect and test all of the systems to our US manufacturing standards. This combination allows us to save you money with the lowest prices, yet with USA quality and reliability. Lowest Cost and Best Value. Best ‘Cost-to-GPD (Gallons Per Day) ratio in the industry! Beware of ‘Pump & Panel’ kits. They are far less efficient and without safeguards for pumping dry, the ability to control pump rate or to add a 12v battery backup system. Rock solid, space-worthy designs by our Aerospace Engineer founder – all pumps, controllers and panels. Watch out for kits with a mishmash of components from other manufacturers. Designed to last a lifetime. Spare impeller adds thousands pumping hours. Guaranteed 85% power output of Solar Cells even after 25 years. Unrivaled efficiency. Compared to grid-tied counterparts, RPS kits have the fastest payback period of any pump in the world. The RPS Optimizer doubles as a solar charge controller for a battery bank. Some customers like to have battery backup on hand and with the RPS kit, you’ll be able to keep them topped off automatically! 100% Money-Back Guarantee and Comprehensive 2 Year Warranty! This protects your investment from manufacturer defects of any kind. Our brushless pump technology mean long lasting maintenance-free water pumping. Insist on brushless pumps to avoid future replacement and repair costs. We love this stuff. If you need anything along the way we will help, though with such reliable pumps, we realize we may never hear from you again! We’re friendly. Call anytime.